President Donald Trump laid out a clear vision for the United States in his inaugural address: "Buy American and hire American." He calls it the "America First" doctrine. It's not just a slogan. The new president promises his plans will create 25 million new jobs in the next decade. It would be the most jobs created under any U.S. president ever, topping even the nearly 23 million jobs added under President Bill Clinton during the boom years of the 1990s. "We will bring back our jobs. We will bring back our borders. We will bring back our wealth, and we will bring back our dreams," Trump said. That line generated the most fervent applause. It might as well be called Trump's economic red line. Trump has tapped into the economic anxiety so many Americans feel. While many acknowledge they are better off than they were in the worst days of the Great Recession -- when 1 in 10 Americans were unemployed, and millions had lost their homes -- too many still do not feel fully recovered. For Trump, no place exemplifies the struggles of Americans than the Rust Belt. He won the election by turning many counties in Wisconsin, Michigan and Pennsylvania -- key manufacturing states -- from blue to red. "Rusted out factories are scattered like tombstones across the landscape of our nation," Trump said. "The wealth of our middle class has been ripped from our homes and redistributed all cross the world." It's true that the U.S. has lost 5 million manufacturing jobs since 2000. Almost all the 11 million jobs added under President Obama came in the service sector, which entails everything from technology and business to retail, hotels and home health aides. While jobs came back under Obama, the pay did not rebound. Middle class incomes are still below where they were in the late 1990s. It's why Trump spent much of his inaugural address promising, "We will make America wealthy again." So how will Trump deliver 25 million jobs? A lot of economists say that would be nothing short of miraculous. 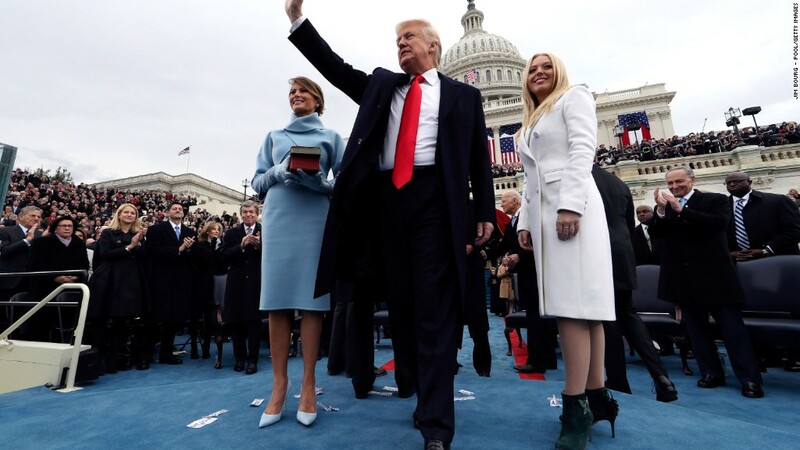 The only specifics he mentioned in his inaugural address were building new highways, bridges, railways and airports "all across our wonderful nation." Trump has outlined the rest of his plan on his website and during the campaign. In addition to infrastructure spending, he wants a massive tax cut for businesses and individuals, a rollback of regulations and renegotiating trade deals and actions, especially with China and Mexico. Wall Street is giddy about most of these ideas (as long as his plans don't cause a trade war). The stock market has rallied about 6% since Trump won the election. And it's not just Wall Street that's optimistic: Consumer confidence is at a 9-year high. Small business confidence is the best in 12 years. 1. America's population is getting older and grayer. Trump hit Obama hard for having the lowest percentage of adults in the workforce since the 1970s (the so-called labor force participation rate is only 62.7%). But now it's Trump's problem. Revising the retiring Baby Boomer trend will be tough, especially without a lot more immigration of younger workers. 2. The robots are here. Trump spends a lot of time talking about jobs going overseas, but many jobs have also been lost to technology. As GM auto worker Robert Sheridan told CNNMoney this week, "I see more and more robots coming. Someone used to put a spare tire in the trunk. Now a robot does it." Manufacturing output in the U.S. is actually at record levels. It's just the U.S. no longer needs as many factory workers to make all those items. Economists predict what's already happened in manufacturing is now likely to spread to the service sector as well, taking away more jobs. 3. The $19 trillion U.S. debt. America's debt is already high. The country has spend a lot of money waging wars in the Middle East and to dig America out of the Great Recession. Trump will have a hard time doing massive tax cuts and more spending without adding an alarming amount to the debt. Some Congressional Republicans are already balking at Trump's plan to spend $1 trillion on infrastructure. 4. Economic growth has slowed in the U.S. and much of the world. Alongside his promise of 25 million jobs, Trump has also said he can get America growing at 4% a year again. That would be almost double what Obama achieved. The U.S. hasn't seen consistent 4% economic growth since the tech boom of the late 1990s. The reality is the U.S. and many other parts of the world aren't growing nearly as fast as they once did. The best explanations are that the workforce has aged (there simply aren't as many prime age workers) and sluggish productivity. It's not that people aren't working hard, it's just that they aren't able to make the great leaps in productivity that were happening in the 1960s through 1990s. 5. No trade war. The biggest fear CEOs, investors and experts have is that Trump will start a trade war. He has talked about putting tariffs -- another word for taxes -- 35% or more on goods coming from Mexico and China. Already Mexico has threatened to retaliate and China is sending strong signals to keep trade open. During the Great Depression, similar tariffs were imposed. It didn't end well for the U.S. -- or other nations. Exit polls from the election indicate that Americans who voted for Trump -- over 80% of them -- overwhelmingly did so because they feel he can "bring change." Trump promised big change for the economy. Delivering on those claims will be monumental.